Ingredients are arranged on a large plate and can include shredded carrot, daikon (a type of radish), cucumber and jicama; accompanied by pickled red ginger, sesame seeds, crushed peanuts and crackers. Additional ingredients include salmon or any white fish that tastes good raw, jellyfish and pomelo. The dressing is made from plum sauce, lime juice, five-spice powder and sesame oil. A vegetarian version is easily made without the fish. Each year brings new variants to the dish, but the base is always the same. It is tossed by everyone at the table – the messier, the better! Surprisingly, the yee sang has its culinary roots by way of Chinese mythology and is traditionally served on the seventh day of the Chinese New Year; the goddess Nuwa is said to have created man from clay and mud on this day. Raw fish symbolises early humankind in their natural form, and the fish is considered a creature of life. 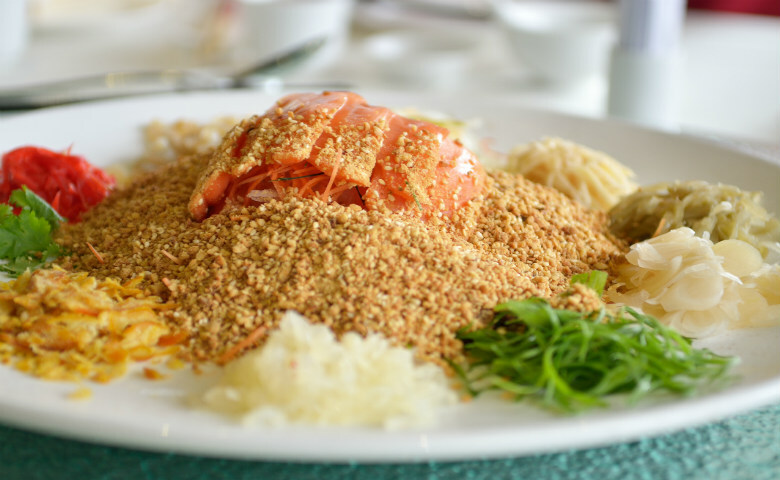 Yee sang is said to have arrived in Malaysia through the mass migration of Chinese labourers from Guangdong during the Industrial Revolution. Teochew and Cantonese families settled in the Straits Settlements of Penang and Singapore, and in Johor. After WWII, the tradition of having a raw fish dish was revived and modified to include raw vegetables, oil, vinegar and a sweetener. There was also a practical intention to the dish – putting the leftovers from the first week of the new year to good use. We all have yee sang in the lead-up to and during the new year; we toss and wish for a better year ahead. But, do we really know what it all signifies? The words ‘yee sang’ can be roughly translated to mean abundance and prosperity. Lo hei means ‘tossing up good fortune’, which is why it’s said during the tossing. Each ingredient denotes something lucky, e.g. the crackers symbolise gold bars, while peanuts and sesame seeds lead to fertility and good health. The higher you toss, the better your luck! Those extra-long chopsticks are there for a reason. Once the yee sang is served, everyone gets up, chopsticks at the ready and the tossing begins. Feel free to toss high and make a mess so your luck, wealth, good opportunities and your general standing in the world improves. Then sit down and tuck into what is a delicious (symbolic) salad, and hope for the best!